I designed and built the Nixie Shoutbox during the summer of 2007. Why build such a thing? Why not? Looking around on the Web for something or other, I started noticing that Nixies, which I remembered very well from having tinkered with them as a kid in the late '70s, were making a comeback. Mostly I saw them being used to make clocks, which is a cool, if rather obvious, application. I was kind of unhappy to see B-7971s, which are alphanumeric, being used in clocks where they will spend their lives displaying only numbers. I decided I would try to create something that would make proper use of the B-7971's rather special capabilities. This is the result. The Shoutbox is a completely original design, and I did the majority of the construction myself as well. No kits. No "smart sockets". No downloaded schematics. Due to the lack of large machinery in my small apartment, and a budget that did not include buying my own etching and plating systems, I did have to shop out a couple of tasks: the printed circuit boards were fabricated from my artwork (Gerber files) by Sunstone Printed Circuit Boards, and the glass top plate was machined by Newport Glass Works. 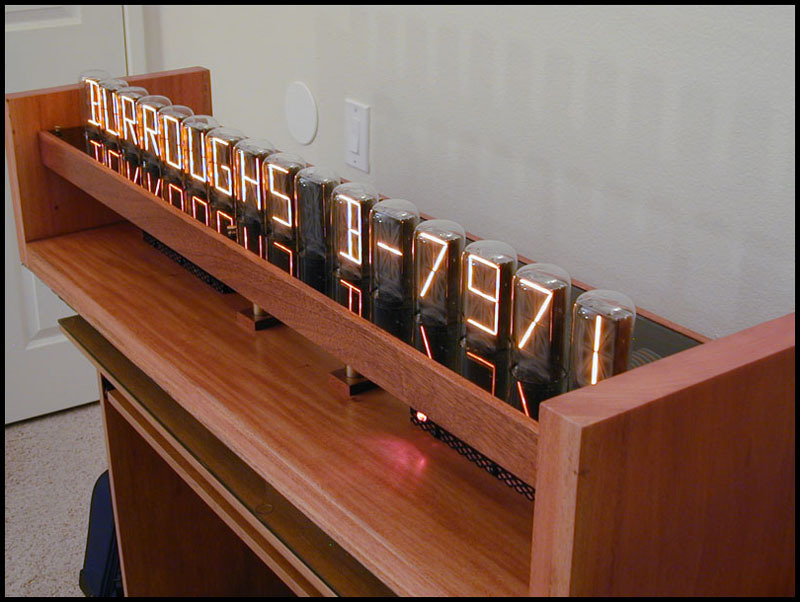 The display devices are Burroughs B-7971 Nixie Tubes. 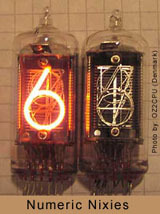 Nixies are cold cathode gas discharge readout tubes that were used in electronic equipment manufactured during the 1950s and '60s. By the '70s they were rapidly being replaced by the "new" LED technology. These particular Nixies are a bit unusual because they can display characters as well as numbers. 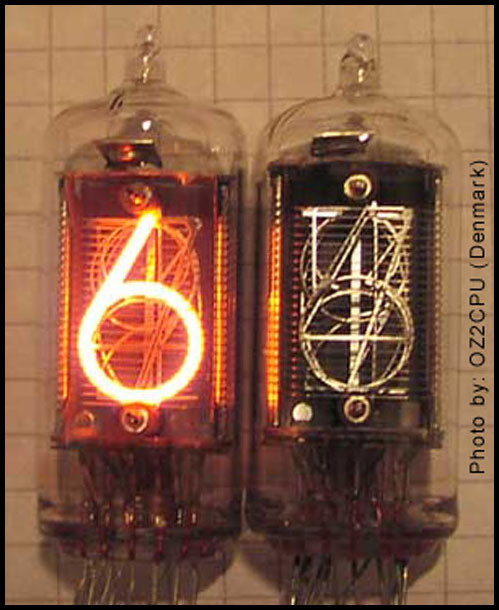 Most Nixies are strictly numeric; instead of having segments they have 10 stacked cathodes, each shaped like a digit. I haven't been able to find out what specific device these B-7971s were originally developed for, but several articles I've seen on the Web suggest that they found application in arrival/departure boards in airports and railroad stations. 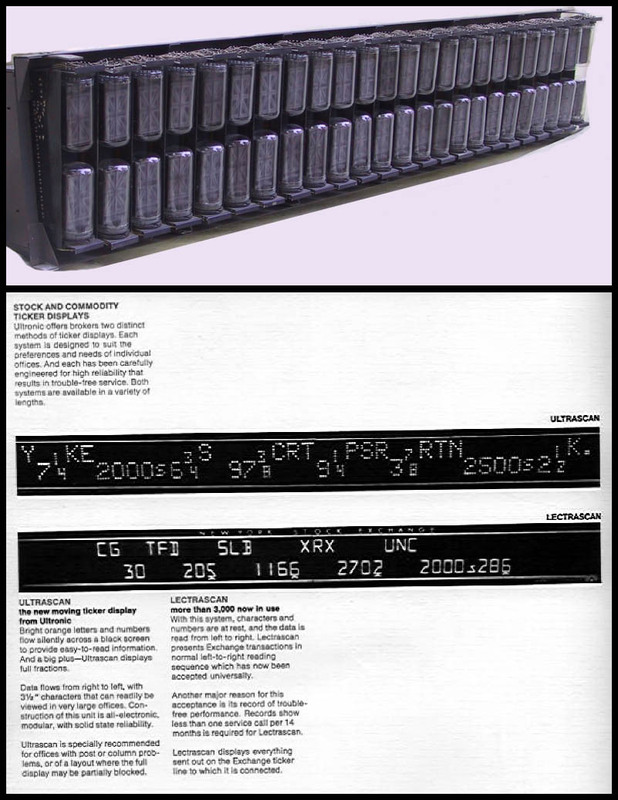 They were also used in the once-popular Lectrascan stock quotation boards that were marketed by Ultronic Systems in the '60s.